The PRO 7000 SmartSeries with Bluetooth is compatible with a wide range of Oral-B heads, so you can find the one that suits you best. Brush the dentist-recommended 2 minutes with entertaining news and weather and also beneficial care tips and rewards. Mainly helps for brushing on your most important regions by allowing you to work with your dental professional and fix time in each quadrant of the mouth. Helps to monitor your brushing habits over time with intuitive graphs and charts, and keeps up to 6 months of your personal brushing data. 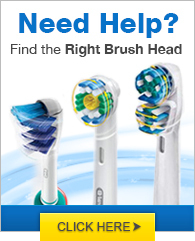 The Triple Pleasure Sensor notifies you when you brush too hard to intercept harmful over-brushing. 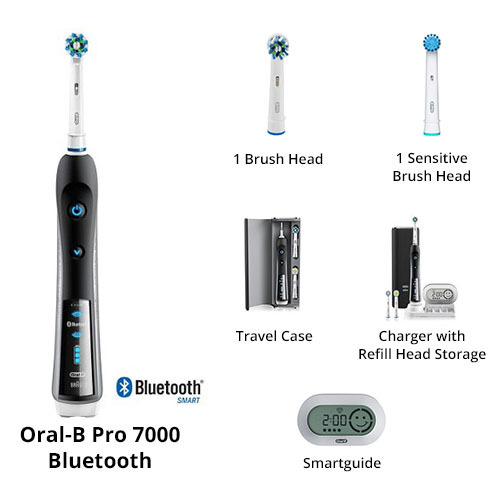 The Oral-B Pro 7000 Black (Bluetooth) has many exciting features for users of all types. You can extend the lifetime of your Oral-B Pro 7000 Black (Bluetooth) with the purchase of a FactoryOutletStore Factory Protection Plan. 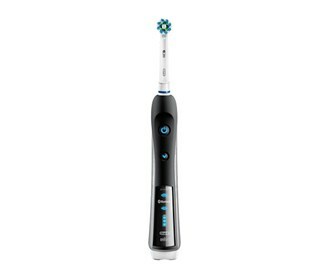 See the Oral-B Pro 7000 Black (Bluetooth) gallery images above for more product views. FactoryOutletStore stocks a full line of accessories like BreathRx Antibacterial Mouth Rinse, BreathRx TongueScraper, and BreathRx Whitening Toothpaste for the Oral-B Pro 7000 Black (Bluetooth). The Oral-B Pro 7000 Black (Bluetooth) is sold as a Brand New Unopened Item.